Geraniums can flower year-round when provided with enough light, water and nutrition. They are sometimes treated as annual flowers because they die off during the short days of winter when not provided with enough sunlight. Regardless of the season, you can keep your geraniums healthy and productive by paying special attention to their light requirements. Geraniums require full day sunlight, especially in the spring and summer months when they are actively growing and blooming. 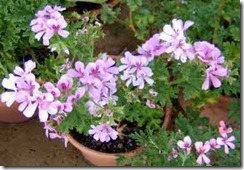 Plant geraniums in a bed that receives at least eight hours of direct sunlight during spring, summer and fall. The plants go semi-dormant in winter and can tolerate as little as six hours of sunlight during this season. Geraniums should only overwinter outdoors in mild climates that rarely experience winter freezing. Potted indoor geraniums still need lots of sunlight; otherwise, flowering diminishes. During the summer months place the geraniums in an east- or south-facing window that receives six to eight hours of sunlight. While geraniums can survive on as little as six hours of light, they will not flower as well as those that receive more sunlight. Bright light is vital, so avoid windows that receive diffused light due to window coverings or those where the direct light is blocked by outdoor trees or nearby buildings. In areas with short winter days, providing enough sunlight is difficult. Supplement minimal sunlight with fluorescent grow lights. Place a single or double fluorescent tube light 12 inches above the top of the geranium plant. Provide four hours of additional light beginning at sunset. During prolonged periods of overcast weather and limited sunlight, provide all-day fluorescent light for 12 to 16 hours each day. Set the lights on a timer if possible, as this prevents you from forgetting to turn the lights on or off. While geraniums can be overwintered in pots indoors, they can also be uprooted in their semi-dormant state. No light is necessary when using this method of overwintering. Light during this period can force the geraniums into active growth, which causes them to die. Hang the bareroot plants in a dark, cool basement. Place the plants in an open paper sack during storage to ensure that they remain in the dark.